VATICAN CITY (CNS) — The general postulator of the Society of Jesus said he has begun compiling all of the writings of Jesuit Father Pedro Arrupe and seeking eyewitnesses who can attest to the holiness of order’s late superior general. The massive task of compiling a list of 120 witnesses, especially those who personally knew Father Arrupe, should “be finished in about a year,” Jesuit Father Pascual Cebollada, the postulator, told Catholic News Service July 13. “I can tell you that these witnesses will be from various places: from Spain where he was born; Japan where he was first sent by his superiors; and from Rome where he lived the last years of his life,” Father Cebollada said. “We are still at the beginning of the process, but Cardinal Angelo de Donatis, the vicar of Rome, has given the Diocese of Rome’s approval to open the process of beatification,” Father Sosa said. Father Cebollada, who is responsible for overseeing the sainthood causes of Jesuits, told CNS that he has met with the judicial vicar of the Diocese of Rome to discuss the initial phase of gathering information regarding Father Arrupe’s life and works. Once the postulator has the list of potential witnesses and has collected the writings, the formal opening of Father Arrupe’s sainthood cause would be opened by the Diocese of Rome, which is the diocese where the former superior general died. Born in Spain, Father Arrupe entered the Society of Jesus in 1927. Following the expulsion of the Jesuits from Spain in 1932, he continued his studies in Belgium, Holland and the United States. After ordination, he was sent to Japan in 1938. 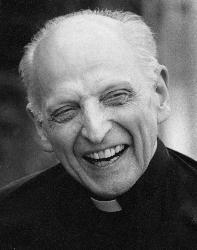 In 1965, Father Arrupe was elected superior general of the Society of Jesus. He resigned in 1983. Father Cebollada told CNS that Pope Francis and countless other Jesuits who lived during and after Father Arrupe’s death in 1991 continue to be inspired by his life and spirituality. Pope Francis “gave several examples of Father Arrupe as a person who helped us Jesuits rediscover our spirituality in the 1970s,” Father Cebollada said. Despite the pope’s admiration for the late superior general, Father Cebollada told CNS that Pope Francis will play no role in preparing Father Arrupe’s cause. “The pope is the last person in this long process of discernment in a beatification or canonization cause. He is the last judge, and, in the end, it is he who approves the decree. So, he cannot be in the middle of this; he, or his successor, is the one at the end (of the process) who would eventually sign the decree,” Father Cebollada said.